Muhammad Ali in Ennis, Co. Clare, where he became the first Honorary Freeman of the town. Thousands turned out to welcome Muhammad Ali, 67, to Ennis, County Clare, the birthplace of his great-grandfather, on August 30. The purpose of his and his wife Lonnie’s visit was to inspire awareness and support for the recently established Alltech-Muhammad Ali Center Global Education and Charitable Fund, and also for the Muhammad Ali Center in the Alis’ hometown of Louisville, Kentucky. The former three-time world heavyweight boxing champion was named the first Honorary Freeman of Ennis, for his sporting achievements and his charitable work. Ali’s ancestor Abe Grady emigrated from his home on the Turnpike Road in Ennis to America in the 1860s. Grady sailed from Cappa Harbour in Kilrush, County Clare, eventually settling in Kentucky, where he married a free-born African-American woman. Their son later married, and one of his daughters was Ali’s mother, Odessa Lee Grady. She married Cassius Clay, and they settled in Louisville, where their son was given his father’s name on his birth in 1942. He changed his name to Muhammad Ali when he converted to the Nation of Islam after winning the world title in 1964. Muhammad Ali in Ennis with Mayor Frankie Neylon, Dr. Pearse Lyons, president of Alltech, and Ali’s wife Lonnie. The trip brought back memories of Ali’s other trips to Ireland. In July 1972 he was victorious over Al “Blue” Lewis in a non-title bout at Dublin’s Croke Park, and he attended the Special Olympics in Ireland in 2003 – the first time it was held outside of the U.S.
Alltech Biotechnology organized Ali’s visit to Ireland, which included his attendance at a charity event in Dublin. A civic reception also took place in Waterpark House, Drumbiggle, in the afternoon before Ali embarked on a drive throughout the town to visit the birthplace of his great-grandfather. 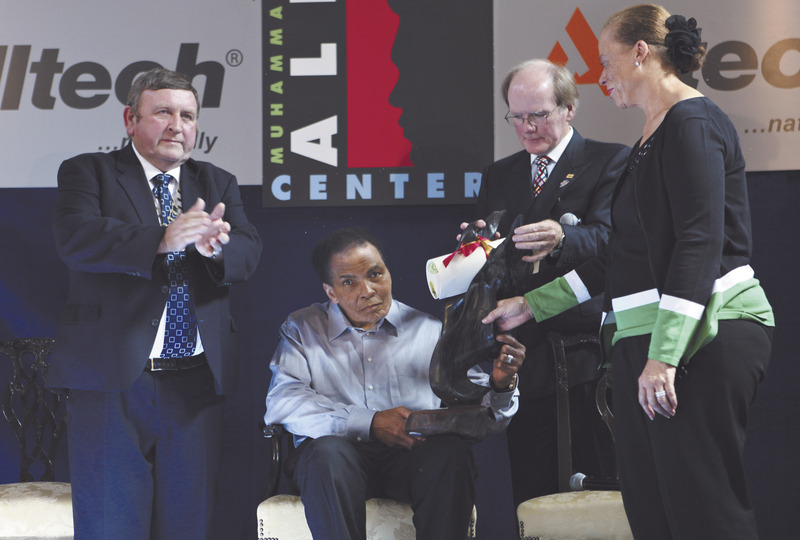 Greg Roberts, president and CEO of the Muhammad Ali Center in Louisville, said, “For Muhammad to visit the site where his ancestors lived and to receive the freedom of the town of Ennis is something that is deeply humbling to him as he has such a keen interest in his roots.” Ali, who suffers from Parkinson’s disease, did not address the crowd.